South Korean President Moon Jae-in and his Filipino counterpart Rodrigo Duterte agreed Monday to enhance their countries‘ bilateral relations and expand their economic cooperation. In a bilateral summit held at Moon’s presidential office Cheong Wa Dae in Seoul, the two leaders also agreed to work together to peacefully rid North Korea of its nuclear ambition. “President Moon Jae-in expressed gratitude to President Duterte for his active support for our government‘s efforts to peacefully resolve the North Korean nuclear issue and establish permanent peace on the Korean Peninsula,” Cheong Wa Dae said in a press release. Duterte arrived here Sunday for an official visit that will end Tuesday. “Noting President Moon and the South Korean government’s efforts have greatly contributed to the recent peaceful developments on the Korean Peninsula, President Duterte said the Philippines will continue to support the South Korean government‘s efforts,” the press release said. The Filipino head of state also expressed hope to further increase the countries’ bilateral cooperation, saying Moon‘s New South Policy may help realize his country’s own development plan, known as Vision 2040. The New South Policy is one of Moon‘s key international initiatives, under which Seoul seeks to greatly improve its ties with all 10 member states of the Association of Southeast Asian Nations, including the Philippines. 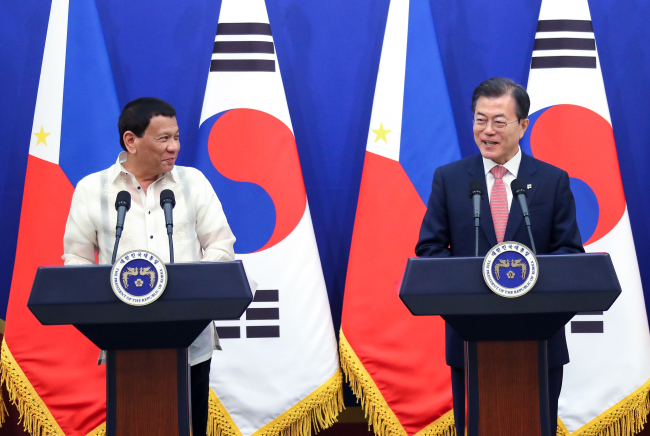 To this end, Seoul has agreed to expand its economic development cooperation fund to the Philippines to $1 billion, according to Cheong Wa Dae. “The two leaders welcomed our country’s decision to expand its EDCF for the Philippines to $1 billion and agreed to further develop the countries‘ cooperation in the transportation-infrastructure, energy, water management and ICT sectors,” it said. President Moon called for efforts to boost the countries’ bilateral trade. “Trade volume between the two countries came to $14.3 billion last year, but I believe that still is not enough,” he told the Filipino head of state, according to Cheong Wa Dae pool reports. “The two countries have enough potential to further expand their trade and investment,” Moon added. Duterte vowed to work closely with President Moon to “write a new chapter of cooperation, friendship and partnership in history” between the two countries, according to the pool reports. To further promote exchange of people between the two countries, the leaders agreed to designate 2019 a visit South Korea-Philippines year, marking the 70th anniversary of the establishment of the countries‘ diplomatic ties. Moon and Duterte also promised better police protection for their people in each others’ countries. “While expressing satisfaction over the close cooperation between the police authorities of the two countries, President Duterte promised the continued interest of the Filipino government to better protect our citizens in the Philippines,” the press release said. Following their summit, the two leaders held a joint press conference to announce the outcome of their meeting.